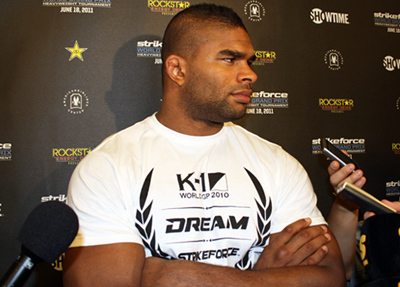 Alistair Overeem’s Vacant Title: Set for the Grand Prix Winner? With Alistair Overeem's title belt now in the shelf, will the new bearer come from Strikeforce's Heavyweight Grand Prix? After Alistair Overeem’s release in Strikeforce, officials remained mum on what’s going to happen next. However, it is no brainer in case the promotion opted to give the title to the Heavyweight Grand Prix winner. As the promotion sets the semifinals of the Heavyweight GP on September 10, Alistair Overeem cited a toe injury, forcing him to withdraw from the said match. A few days later, Strikeforce axed the fighter out in the roster completely. That said, the event’s final four is now composed of Josh Barnett, Antonio Silva, Sergei Kharitonov, and – Alistair Overeem’s replacement – Daniel Cormier. The Strikeforce Heavyweight Grand Prix is expected to wrap up by early next year. More Strikeforce news are sure to come, so just keep it posted here at Fighting Insider.